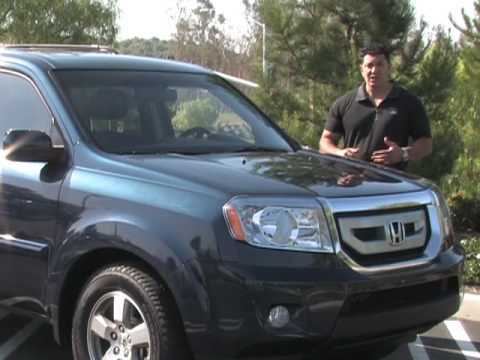 If you're looking for a true eight-passenger vehicle that offers more on- and off-road capabilities than a minivan, the 2009 Honda Pilot belongs on your list. It can accommodate three child seats in the second row and actually fit adults in the third row. 2009 Honda pilot ~ by far, the best vehicle I have ever owned! Purchased this vehicle new in the spring of 2009 and it is by far the best vehicle we have ever owned. Previous to this, we would trade in and purchase new vehicles every 3-4 years, but since buying our ‘09 pilot, it is been so great for our family we haven't wanted to trade it in. I am also not impressed with the newer body style or the overall look of the pilot since the changes that were made in 2016. We currently have 130,000 miles on our SUV, and it honestly drives like it did when we drove it off the lot 9 years ago. Other than regular upkeep and scheduled maintenance, we have not experienced any problems or issues with this vehicle. I will say that keeping up with regular oil changes, taking it to the dealership every 30,000 miles or so for maintenance checks and bringing it in for any recall updates is so important, as it is with any vehicle. Our Honda pilot has gotten my family with 2 small children to and from many family road trips and vacations. It is comfortable to ride in and so comfortable to drive! I have had countless friends and family comment on how nice it drives and the generous amount of head space and elbow room there is for the driver. Overall, I have been extremely satisfied with my Honda pilot and would recommend it to anyone looking for an SUV of this size. I recently had my local body shop buff out the entire thing, removing all of the scratches, dings and general road/weather/parking lot imperfections. The paint came out beautifully!! It truly speaks to the quality of the factory paint job. We are happily going on 9 years with our Honda pilot and we will continue to enjoy it for as long as possible. The touring edition has a feature for everyone! My pilot is a touring edition so it has a backup camera, navigation, built in DVD player, and 3rd row seating. I love my pilot. My family and I travel a lot and it has always been dependable. The seats are easy to put up or down to accommodate several passengers. The DVD player helps on long trips, the back up camera helps eliminate blinds spots, and the pilot has tons of bonus features. You can set the driver seat to each driver, the vehicle tells you when you're running low on oil life, tire pressure etc. & to be an SUV it has great gas mileage. I would recommend the pilot to anyone. My Pilot is very comfortable to drive, has a lot of room. It's fully loaded with heated leather seats that are very comfortable especially with long car rides. Power sunroof. It has over 100,000 miles and still runs very well! There is no blind spot which makes it easy to see all around while driving. The only thing that has been acting up is my power mirrors. It is really roomy inside. Since it's an older vehicle the GPS is not updated nor are the features with the radio and console. But I can still use bluetooth for hands free cell phone use and the stereo system sounds great!